This about as “CAT Synth” a picture as one cat get. A cute cat playing an Octave CAT synthesizer. From the Vintage Synthesizer Museum on Facebook. The Cat Man of West Oakland, like the Vintage Synth Museum, is a local treasure. We hope to feature more of them both in the near future. 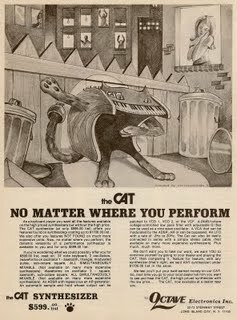 Well, that’s quite an interesting pairing: dog sticker barking at The CAT – specifically, an Octave CAT synthesizer. Seen on matrixsynth. This one recently came in to Thesis Audio for restoration. Anyone know what the source of the sticker? I believe this is only the second time we have featured a dog in a synth in over twelve years. A moody picture of Enid the cat posing with an Octave CAT synthesizer. 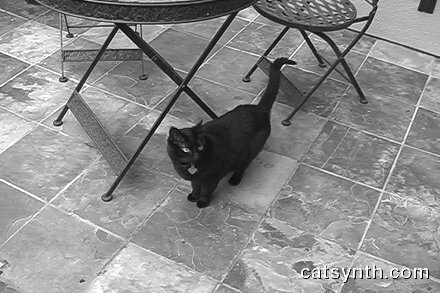 Cat and CAT! Sometimes things linger undone for a quite a while. And that is the case with reviewing the Quickening Moon Concert, which I am finally getting around to doing as the next Full Moon concert is about to happen. Basically, the process goes like this. I wait a few weeks to look at the video of my own performance with a fresh perspective. I review the videos. Then post them online. Then a few more weeks pass as life intervenes. So here were are, finally getting to it many “moons” later. Memories of course fade over time, but even going by my own recollections, there is much to recall fondly. Bottom line is that it was a really good performance, in fact I would consider it one of my best solo electronic sets to date. This was in no small part to the advance preparation, but also to the audience, which filled to the Luggage Store Gallery to standing-room only capacity! This was also one of the larger setups, featuring the Octave CAT vintage analog synthesizer, E-MU Proteus 2000, DSI Evolver, Korg Kaoss Pad, a Mac laptop running Open Sound World and Max/MSP, and the Monome controller, along with an array of my folk instruments from China and India. 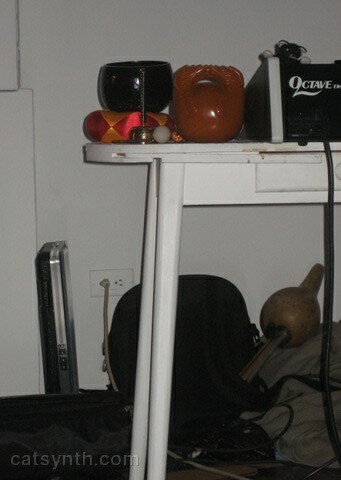 Even the iPhone made an appearance as an instrument. The music was improvised live, with some prepared guidelines. In this way, it was reminiscent of the live music performances from old silent films. I kept the music relatively sparse and maintained the focus on the visual elements, which moved back and forth between clips of Luna and abstract visual elements (you can read more about the video production here). The audience clearly responded to the video of Luna and the music, and their laughter at very points reminded just how funny a piece this was. It was easy to lose sight of that in the hours of very detailed and very technical preparation, and one of the delights of playing in front of a live audience. I also heard from people that could tell they were able to sense the affection for Luna that came through in the video, though the long shots and the breaks in the otherwise silent video where her voice came through. 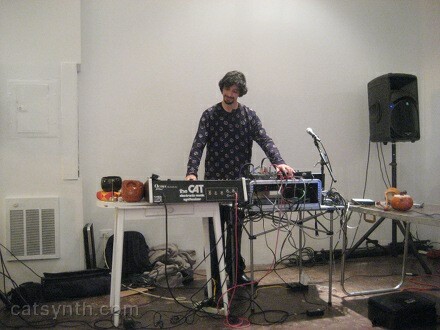 The balance of the set leading up to 月伸1 featured various combinations of electronic and acoustic instruments. The monome was my main controller in several of the other pieces, including the opener that focused and live sample loops and patterns from the folk instruments. I played the instruments live, and then replayed the samples in various patterns on the monome to create complex timbral and rhythmic patterns. I also used the monome in a later piece to control some very simple but musically interesting sound synthesis, as can be seen in this video. The lights on the monome are visually compelling, but also provide a link for the audience between the actions (which are really just button pressing) and the music. Several of the pieces including strong rhythmic elements, which helped propel the set forward – I even saw at least one person “grooving out” to one piece. 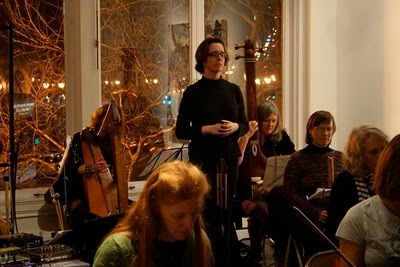 I replayed several of the pieces (but not the video) in another performance a few days later at the Meridian Gallery. I certainly hope I will have an opportunity to the video again as well. My performance was followed by the premier of Polly Moller’s Genesis. Genesis is “a musical experiment in which the M-theory of the 11-dimensional universe combines with the inward and outward spiral of the Western magical tradition.” The 11 member ensemble represent the 11 dimensions (which include Universal Time, the three spatial dimensions, and seven others) who combine to bring the “New Universe” into being, as portrayed by Matt Davignon on drum machines. Polly Moller conducted the piece, not from the traditional podium in front of the ensemble, but rather by walking in an inward and outward spiral among the performers. As she walks by, wind chimes in hand, different performers enter or exit. As the New Universe comes into being, Matt Davignon’s electronic performance emerges, culminating in an extended solo as the 11 performers representing the “parent dimensions” fade out. Quite fortuitously, someone turned my video camera to face the ensemble, so I was able to capture some video of the performance. In the clips below, one can see the conducting by walking in a spiral, as well as parts of the New Universe solo. Over the last few days, I have largely been absorbed by preparations for my next performance. This one includes a more ambitious element, a 10-minute video entitled 月神1 featuring clips of Luna as well as abstract elements reminiscent of experimental filmmakers such as Stanley Brakhage or Gerhard Richter. The video will serve as a backdrop for live electronic improvisation – it is mostly silent, though I did include some sound at various points so the audience could hear Luna’s voice. 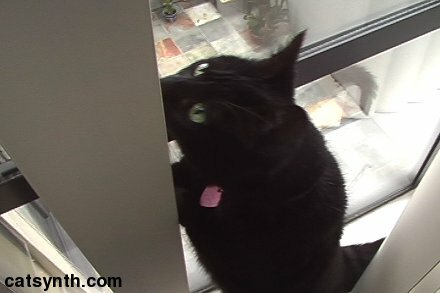 Some of the video clips of Luna were featured here on CatSynth in the past, including her chattering video, or playing with her blue fish toy. 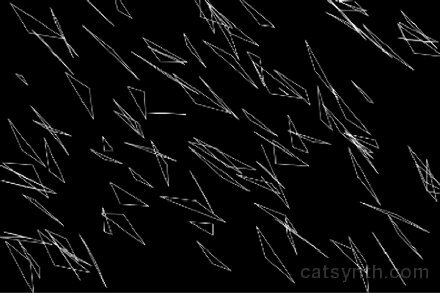 The abstract elements were done is a software package called Processing, a programming language for images, animation and interactions. Musically, I will plan to focus on a mixture of the Evolver and the Octave CAT synthesizers, along with software on the iPhone and laptop. Indeed, this is the first time I will be using the CAT live, mostly because I am reluctant to move it too often. Of course, this will only cover about one third of the full performance, so I will be drawing from my repertoire of electroacoustic improvisation to round out the remainder of the time. Although I reuse elements, there is always something new to discover in them. Luggage Store Gallery, 1007 Market Street @ 6th Street, San Francisco. The Full Moon Concert Series is an experimental music series offered by Outsound Presents, in partnership with the Luggage Store Gallery. Each concert explores the traditional lore of the Full Moon, and in January, the second annual “Quickening Moon” will feature new music springing to life. First up will be Amar Chaudhary in a solo electronica set (collaborating with his wonder-cat, Luna), followed by the world premiere of a new work for twelve improvisers by Polly Moller, entitled Genesis. I believe we have seen seen this picture with the actual cat before. 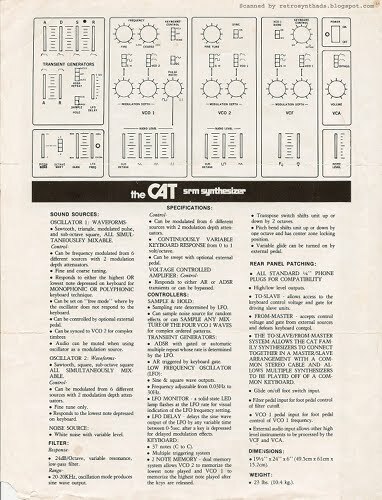 Additionally, the spec sheet contains the blank patch diagram that I have occasionally used for the Octave CAT. You can see full-size images as well as additional analysis at Retro Synth Ads. The article also features quotes from me as the author of CatSynth, and our friend matrix of matrixsynth. Do check out the full article. 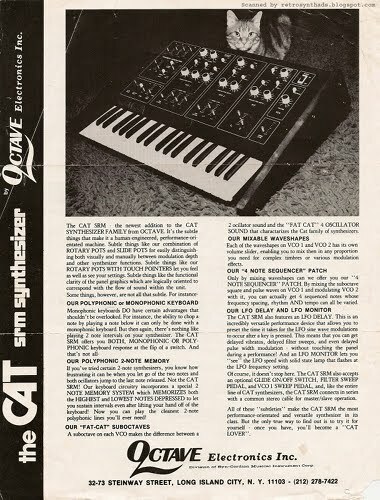 Coincidentally, we did feature another Octave CAT advertisement in a previous post. 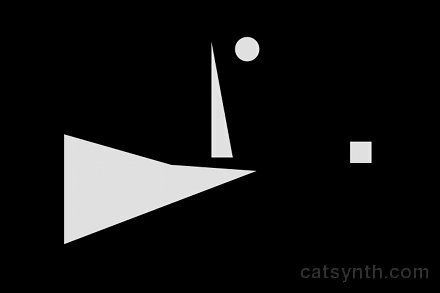 It’s a notable event here at CatSynth when we see catch a feline next to an Octave CAT. Visit more Cats on Tuesday. Click here to listen or subscribe. This weekend I decided to spend a few minutes playing with the OctaveCAT synthesizer before packing it up (part of our preparations to move). In part, I simply wanted to make sure it was working, but it is also a great instrument for improvisation.